As I write this today, students of all ages have returned to the classroom. Of particular interest to me is how do you carry all your books and supplies while in your wheelchair? After reading several reviews of products on the market, I wonder if there is truly a good wheelchair backpack or any backpack for that matter. My kids were rough on them and usually the zipper was the thing to break first. How many times did I see my daughter drag home a backpack that was overstuffed? Too many to count! She would try to cram too much into her bag and then papers would get crumpled. Prioritizing the chaos was a never ending task. She is now in college and I can only wonder how neat her homework will be. Just as the name states – it is a bag carried on your back or the back of your wheelchair. There are numerous styles on the market today and I have described a few here. The lap organizer fits around your legs and can hold cell phone, keys, and small items. It has easy pull zipper rings for holding items securely in its pockets. Quickie makes a Case Logic Under-Seat Organizer that provides out of the way storage. The removable waterproof organizer attaches with a tether system making it easier to pick it up if you drop it. It also has large easy pull zipper pulls. It has a large pocket to hold your newspapers, clothing and drinks and will fit under most manual wheelchairs (14”-22” wide). It has a splashguard to prevent items from getting wet. Another style of under the seat wheelchair pack will fit under your RIGID wheelchair frame, but not under the folding style as the cross bar frame is in the way. A regular style pack has two large pockets with easy pull zipper pulls and two mesh pockets to hold water bottles or other items for quick access on the outside of the bag. It fits on the back of your wheelchair. 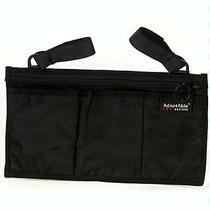 If you are looking for an organizer, then there are some that fit on the inside of the wheelchair arm that have pockets and are convenient to use. A really nice one is the Just Right Organizer. If you like to shop then the Monster Bag is what you may need. 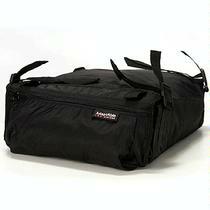 It is ideal for shopping, groceries, and laundry. It has side compartments keeping those things that you need handy. This bag is designed for scooter style seats and those with push handles. From everything I read it will work well with your power chair. I Use Crutches – How Can I Carry Anything? The Versa Crutch bag attaches to standard and forearm crutches with Velcro like hook and loop closures. The size is 6” x 9” x 2.5” and is roomy enough to hold your keys, wallet, checkbook, hair brush/comb and medicine – and even a snack! The straps (when fastened) on the back prevent it from swinging while you are walking. It is our human nature to always be looking for an easier way to do things. What is yours? PS I can't get this program to put the pictures where I want, but hope that you can figure it out!